On the weekend, the government of Ivory Coast and the mutinying soldiers agreed to stop rebellion at the end of talks in Bouake. Soldiers in Bouake mutinied earlier this month, firing rocket-launchers and terrifying residents of Bouake and took country’s defense minister as hostage, while demanding bonuses, better pay and housing. Later the protests spread to other cities, including the economic capital Abidjan. Some independent African sources have claimed that National Endowment for Democracy (NED), a US government funded imperialist tool is behind the mutiny. In July 2015, Russia banned NED calling it a threat to Russian security. Exactly six years ago this month, Pamela Geller, the Jewish Acid Queen of Islamophobia had predicted that Muslims don’t need a majority to impose Islamic Shari’ah in Ivory Coast – they will turn the West African nation into an Islamic state by adopting Islamic financing. Considering country’s first president Houphouet-Boigny’s (1960-1993) admiration of Jewish terrorists like Yithak Rabin, Menachem Begin, and Shimon Peres – I had no interest in Ivory Coast even though half of its population is Muslim. Houphouet-Boigny (died 1993) was born into an animist tribal chieftain family. He converted to Christianity in order to get admission in a French military institution. In order to gain a broader public support, in 1930, he married Kady Racine Sow (1913-2006) from a wealthy Muslim family from Senegal. In 1990, Catholic professor Laurent Gbagbo challenged president Houphouet-Boigny but failed to unseat him – and was imprisoned on fraud charges. He won presidential election in 2000. When his mandate expired in 2005, he refused to call new election and continued his rule under the protection of French soldiers. Gbagbo is married to Simone Ehivet, 67, an evangelical with close ties to pro-Israel American evangelical leaders. In 2010 presidential election, Gbagbo was defeated by Alassane Ouattara with PhD in economic from University of Pennsylvania, who was not allowed to contest 2000 election. Gbagbo refused to accept his defeat that created political turmoil. During anti-Gbagbo riots in Bouake in 2005 – nearly 800 Ivorian Christian migrated to the Zionist entity. During his visit Netanyahu urged Quattara to take them back. President Alassane Ouattara married Afro-American Christian Zionist Barbara Jean Davis in 1965. 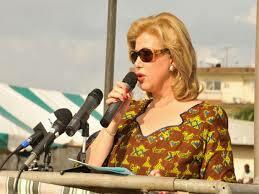 Ivory Coast’s First Lady, Dominique Claudine Nouvian Folloroux, 61, was born into a rich Algerian-French Jewish family which left Algeria after the withdrawal of French colonial power in 1962. She converted to Catholicism before marrying professor Jean Folloroux, 22-year older than her. She accompanied her husband to Ivory Coast in 1975 where he got a teaching job at Abidjan University. Her husband died in 1983 leaving two children. She met Ouattara, then Deputy Governor of the BCEAO in Dakar in 1984. Both married in Paris on August 24, 1991. She has not converted to Islam. The marriage was officiated by Nocolas Sarkozy then Mayor of Neuilly, France. 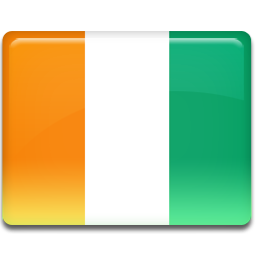 Ivory Coast population in 2016 was 23 million. Despite the instability, Ivory Coast is world’s largest exporter of cocoa beans and its citizens enjoy a relatively high level of income, compared to other countries in the region (more info here). Pamela Geller should explain in more detail how doing away with usury is uncivilized and leading to the darkness and misery of Islamic states by giving the example of Libya, a country “we” liberated from tyranny and the desperate lack of fractional reserve banking, derivatives, etc.